Well well well, winter has hardly dipped its little toe in NYC this year (yay! ), however, I have found one problem that has persisted through this pleasantly mild winter: Dry Skin. Waking up with dry, flaky, parched skin and a slightly sore throat is no way to live through 6 months out of the year. Drinking plenty of water and using rich moisturizers can only do so much when there is under 40% humidity outside. My previous apartment had big metal radiators, so I used to leave bowls of water on them and pray my cat didn't drink all the water before it could evaporate and do its job of humidifying our apartment. Buying an ACTUAL humidifier would have been a better solution, however they can be very bulky, expensive, and take up precious floor space. I love when functional utilitarian objects are re-vamped to be cute. 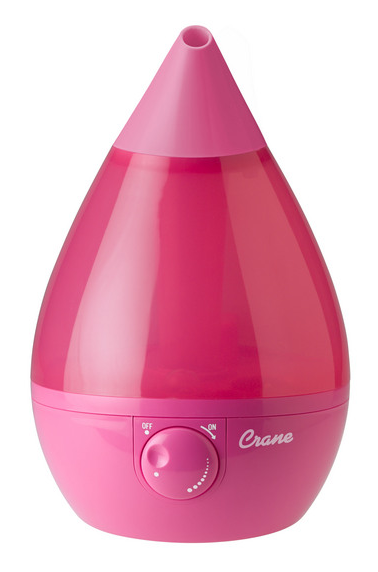 This one is cool mist and whisper-quiet, my two favorite amenities in humidifiers. It works up to 250 sq. ft, which is perfect for a bedroom. My husband might not be so anxious to have a big pink tear drop grace our place, lucky for him it comes in a variety of colors. Save space and my skin? Don't mind if I do!